Water in Textiles and Apparel: Consumption, Footprint, and Life Cycle Assessment provides a thorough analysis of one of the most urgent issues facing the textiles industry. As water is essential to the textile production system, and as availability of water is reduced due to natural and anthropogenic factors, the industry must respond. 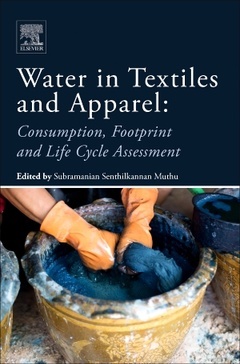 With a thorough treatment of both life cycle assessment and water footprint perspectives, this book provides practical strategies for responsible water use across the textile supply chain. Readers will learn essential information from research and industry case studies that will help them understand the textile industry?s role in this issue. Environmental, quality, and operations managers of textile companies. Postgraduates and researchers in disciplines including textiles, fashion, apparel, textile chemistry, environmental science, chemistry, and printing technology.